""When you are in Love you can't fall asleep because reality is better than your dreams." Boy, have we got a treat for you! After two years of loving collaboration, we have finally published our most excellent new cookbook, titled "Food For Lovers!" It's the ultimate soul food cookbook for lovers. Whether you are a new bride who can barely boil water, or a seasoned veteran looking for fresh new meal plan ideas, this is a must-have for your cookbook collection. No more trial & error; all of these recipes are excellent and well-loved. This thing is great, packed with lots of time-tested, generation-proven recipes and menu ideas. 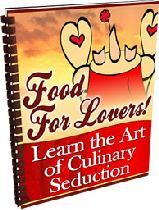 Included are tips to set a romantic mood for a sensuous dining experience with your lover (or lover-to-be). Guys, this would make a unique and appreciated birthday gift. Install it on her computer! Dear Stella: But I Tried so Hard! I was friends with a woman with who 6 years into the friendship, we took the next step. She is 16 years older then me but has the mind, soul and body of someone my age. I gave her everything I could, expecting nothing in return, just her honesty. Everything was great, then after about 4 months into the relationship a wall was erected by her. I did not understand why, things were great. It was like night and day. I tried to do so much and fell into a depression because it felt like I was beating a dead horse trying so hard to figure it out. She made up so many excuses. I tried to give her and her children as much love and respect as I could, with her in return putting down my children and never taking into account my feelings when I tried to talk with her maturely. 5 months of this have passed and she still says she wants me as a boyfriend. I try to talk about a future with her, but because of her past relationships (of men cheating on her) she feels she can only do it on her own. I don't know what to do, I do love her but I cannot seem to get anywhere. Should I let go and move on? Why is it so hard, is it because I feel like I tried so hard and lost? it appears like you tried TOO HARD. You know? is not lost, yet. My advice to you is to back off, way off. arrange a long trip for yourself, if possible. her, too. Good luck! Stella. ***Read more free love advice or even submit your own problem to Stella!